The Carolina Hurricanes made the playoffs for the first time in a decade. Their 3-1 win over the New Jersey Devils, coupled with the Montreal Canadiens loss to the Washington Capitals, sealed the deal. They have been in a pressure cooker, and the playoffs will make it even more intense. But some guys love the pressure and respond well when it is the hottest. I don’t think it’s more pressure. I would say it’s more fun. You know, when you go into those games, you know you play for something. It’s not like you’re going to say, ‘Well, next week it’s over.’ So, we play for something and that’s fun. It sure is fun for the fans, and it looks like Mrázek is having fun too. The atmosphere in Raleigh’s PNC Arena is absolutely electric. Attendance is up and so is the volume at one of the NHL’s loudest arenas. Ten years of frustration are being transformed into moments of hopeful ecstasy and it’s loud. With a playoff spot clinched, it will get even louder. Mrázek came to the Hurricanes from the Flyers after what seemed to be a promising career turned into disappointment with the Detroit Red Wings. I wrote at the beginning of the season that he can be magical or frustrating. For the most part, he has been magical. 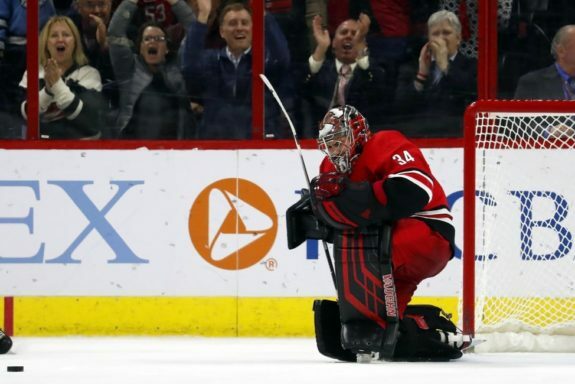 Along with his co-goalie Curtis McElhinney, the Hurricanes’ net has been protected in fine fashion throughout the season, putting the team in the position they are in now, where they have an excellent chance of making the playoffs. While Mrázek tends to be more dramatic in goal, McElhinney is calmer. In either case, the defense seems to play hard for both goalies, something that did not happen at times in the past for previous netminders. Interestingly, when Mrázek came to the Hurricanes, he said that having a one-year deal would put a lot of pressure on him, and he liked to have that pressure. Sounds like not much has changed, except perhaps that his one-year deal might become multiple years if he keeps bringing the magic. I think no, there’s no pressure. I think you want that stuff. You want to be in meaningful games. You don’t really want to play just to play. I mean there’s obviously pressure but it brings out the best in people. The pressure, or lack of it, has brought out the best in Hamilton. Or maybe it was the piece I penned in December asking if he had left his game in Calgary. Seriously, Hamilton has been on a scoring spree lately and the pressure to make the playoffs seems to have brought out his best. His two goals against the Toronto Maple Leafs gave him 18 on the season, a career high. The Hurricanes have made the playoffs. They have the team that has accomplished what has been a nearly decade-long goal. Their first-year head coach, Rod Brind’Amour has guided his team excellently and he epitomizes performing well under pressure. But, he’s not lacing them up. He’s got to keep his team focused. Meanwhile, Mrázek can keep having fun and Hamilton can keep letting the pressure bring out his best and who knows how far this bunch of jerks will go?